About 4000 people evacuated from their homes early on Thursday because of a broken dike (dam to contain the water of rivers) in Campos, North Fluminense, Brasil. On Wednesday the level of the Paraiba do Sul River reached 10.90 meters. Normal level at this time of year is usually 7-8 meters. Six municipalities of Rio de Janeiro declared a state of emergency after flooding caused by heavy rains that hit slab Muriaé, Itaperuna, Cardoso Moreira, Italva, Miracema and St. Anthony of Padua. All are in the North and Northwest Fluminense. The level of some major rivers rose further. The number of people who had to leave the house now stand at about 35 000. In St. Anthony of Padua, more than 12 000 people are homeless or displaced. The Dove River, which cuts the city, overflowed and left several flooded neighborhoods. More than three hundred drops of barriers have been recorded in the northwest of the state and almost 100 houses were destroyed in landslides. (Globo) The number of people out of their homes because of the rain that reaches different areas of the state of Rio de Janeiro has already reached 34,890, according to the latest statement released by the State Secretariat of Civil Defense. The director general of the General Department of State Civil Defense, Colonel Mark Adams, said there were 5,000 homeless and homeless in Itaperuna 60, 2,500 homeless and 400 homeless in Muriaé slab and 12 000 displaced and 300 homeless people in St. Anthony of Padua. 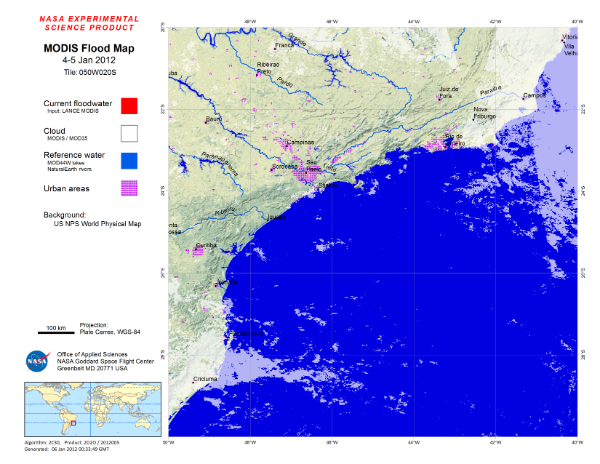 The entire state of Rio de Janeiro is on high alert for the occurrence of more rain during the weekend. According to State Civil Defense the hardest hit areas are north and northwest, beyond the mountains and the Metropolitan Region of Rio. Rain continued to pour down Tuesday over the south-eastern Brazilian states of Minas Gerais and Rio de Janeiro, where it caused floods and mudslides that affected thousands. Since the rainy season started in October, 52 towns have decreed a state of emergency. The towns of Petropolis, Teresopolis and Nova Friburgo, which were badly hit by last year's mudslides and flooding, are on the alert this year too. In the city of Rio de Janeiro itself, rain caused chaos at Santos Dumont airport, leading to the cancellation of one third of the flights scheduled for Monday. According to the Secretary of Defense Civilian St. Anthony of Padua, Angelo Alberto Figueiredo, only two areas of the city were not affected by flooding. The level of the River Dove, he said, reached 5.4 meters, almost two meters above the limit. The city hospital was evacuated before the flood that hit the spot. The Bom Jesus Itabapoana in the Northwest Fluminense, is in a state of high alert, according to the Municipal Civil Defense. The river has risen one meter and 45 centimeters while ussualy received 160 mm of rain in 24 hours, day 2 to 3 days. This water takes about 36 hours to reach the city. The National Institute of Meteorology (Inmet) issued a warning this afternoon for the chance of rain showers, moderate to strong in the north and north-west, the regions most affected by the rains in Rio de Janeiro. According to Inmet, may also occur "significant earnings" of rain in the cities that make the border with Minas Gerais, as well as municipalities in the mountainous region of Rio.